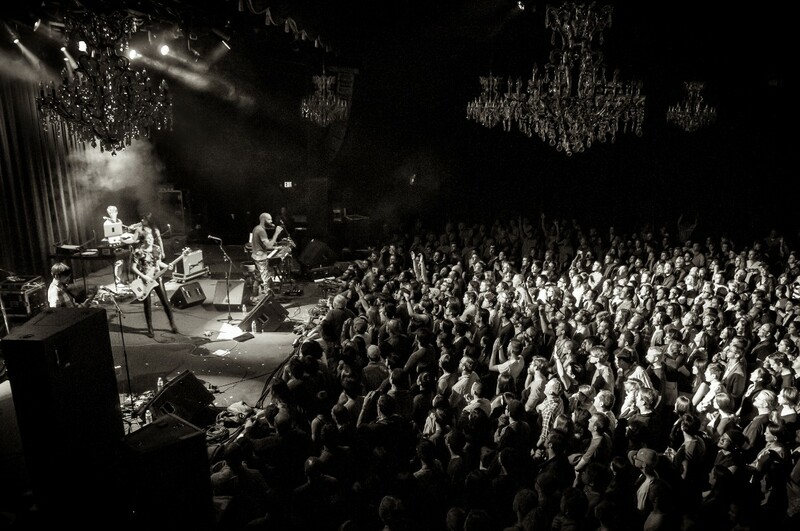 Pomplamoose at the Fillmore in San Francisco. Andy Peters at the soundboard at Maxwell's. 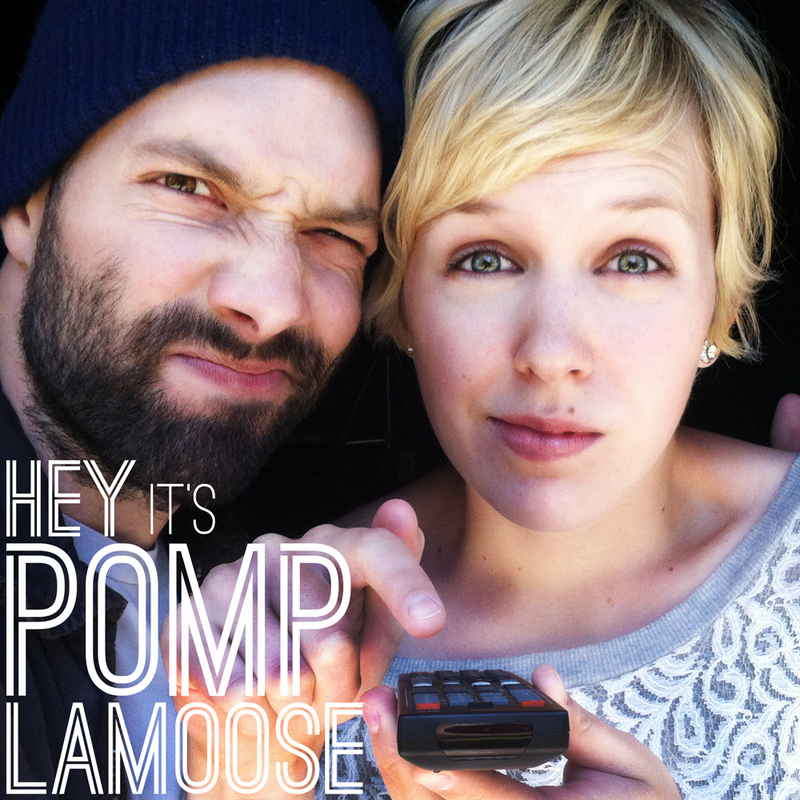 The obnoxious indie-rock duo and YouTube sensation Pomplamoose first turned my stomach during this holly-jolly time of year back in 2010, when its series of cuter-than-cute, tweer-than-twee car commercials were annoyingly ubiquitous on television. Now the twosome is at the center of a hot ’n’ heavy social media debate in the indie-rock world stemming from a piece for Medium.com penned by bandleader Jack Conte. While claiming it “isn’t a sob story,” Conte’s piece nonetheless argues that the touring circuit in 2014 is such a tough slog and challenging grind that these Bay Area artistes made $136,000 in ticket sales, merchandise, and a corporate sponsorship during a month-long jaunt—and still managed to lose $12,000. Ever since Robert Johnson stood at the crossroads and sold his soul to the record company—I mean, Satan—live performance has been the primary source of any musician’s income. This is more true now than ever, given the precipitous decline in the sale of recorded music that Taylor Swift has thankfully recently brought to light. But Pomplamoose claims it’s not just as easy as crooning a few tunes and passing around a hat to collect the coins. In the interest of transparency, and to make a point about the challenges facing what he calls “the creative class,” Conte gives a detailed accounting of all the numbers. What he doesn’t do is question the logic behind any of those expenses. But far more illuminating (and balanced) than my ranting were the comments I saw on Facebook by my old pal Andy Peters, an indie-rock vet who did sound for years at the venerated Maxwell’s in Hoboken and Club Congress and Solar Culture in Tucson; tour-managed and ran sound for the Feelies, Luna, Girls Against Boys, Fred Schneider, and others, and who still flies in to man the mixing board and oversee the business at the occasional rare reunion show by the Feelies circa 2014. When I asked Andy if I could quote some of the points he made online, he instead wrote the following insightful essay. I see two points of view which both oppose this band’s tour financial problems. One: “They should have made money on the tour, and they’re idiots.” Two: “What is this ‘building the brand’ crap, anyway?” They are related. The following makes arguments both for and against the band’s decisions. This is entirely a different approach from the young band doing a punk-rock van tour. To that end, the decision to tour as a six-piece band, thus they need to hire the four extra band members. These musicians have no skin in the game: They will not benefit from the “brand expansion,” they will not see money from royalties or publishing, or any other income stream a full-time band member might see. Therefore, they need to be paid for their services on the tour. However much salary they were paid is between the corporation which is the band and each musician. Nobody should be surprised by this. The band decides it needs two crew members, a tour manager, and a front-of-house mix person. Again, since the crew are contracted for the tour, they require a salary. 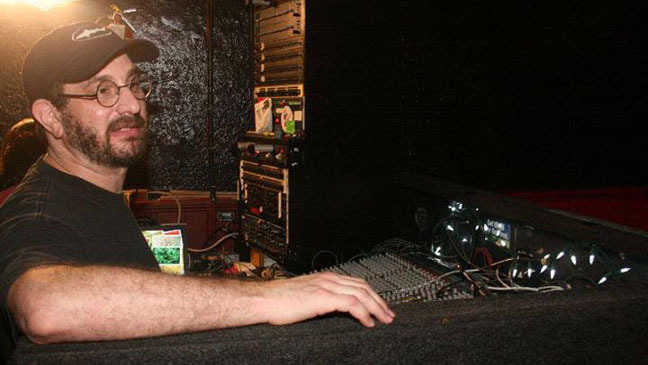 There are those that argue that one person can do both the [tour manager and front-of-house sound mixer] jobs, and that is true, and quite common. But that’s a tough gig. The FOH guy has to deal with technical issues while also dealing with the promoter and the band itself. After the show, the TM needs to settle up with the promoter while also trying to strike band gear from the stage and FOH mix area. After doing all of that work (mixing a show isn’t a passive job), he’s as tired as any band member, and is now faced with driving a large vehicle at night. With two people, the TM can rest during the show and deal with the promoter as required, and then he’ll be fresh enough for the drive. Who hasn’t heard stories of van crashes at night because the driver fell asleep? Next is the issue of the tour vehicle itself. 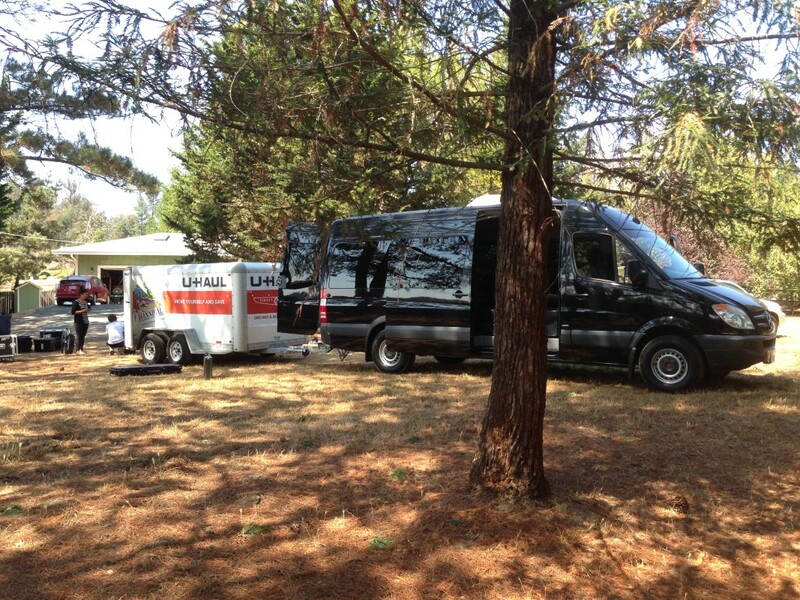 A lot of people believe they were touring in a bus; the pictures I’ve seen show a Mercedes Sprinter van and a trailer. People see “Mercedes’ and think, “Wow, that’s an expensive van.” The truth is that the Sprinter van costs the same as a 15-passenger Ford van, but the Sprinter has a lot of advantages. As supplied by Bandago (a company that rents vehicles to touring bands), these vans come with a back end build for holding cargo, which might often be enough space to avoid a trailer van. They are comfortable to sit in and drive, and get excellent mileage (diesel). Bandago will also allow band and crew to sign onto a Bandago liability insurance policy. Remember that a lot of musicians and crew people who live in big cities may not own a car, so they won’t have liability insurance. Good luck getting any of these sorts of services from U-Haul or other vendors. Some might argue, “Why not buy a van?” (That Sprinter van is $44,000, which is expensive, and most punk bands buy used vans anyway.) If they were touring nine months out of the year, it would make perfect sense to buy a van. But they live in the Bay Area, and it doesn’t seem like they tour all that often. This means any van they buy will have to be garaged, and it’s expensive to park a van in a big city! Plus the van needs to be insured and maintained. Renting is the right choice. Others have complained that the $20 per diem is too much. One guy argues that $10 is sufficient. (Ten bucks was the per diem in the early ’90s.) They say the band should have the venues and promoters pay for food or provide money for a buyout (which they do), but one good meal a day is not enough. Everyone knows road food is bad, and truck-stop and fast food are terrible. Spend the extra few bucks on decent food. Now if this was a punk-rock van tour where it’s all for one and one for all, then one might expect that per diems are skipped entirely. But it wasn’t: There were six hired hands who deserve to be able to eat decent food. And the hotels. The punk rockers will say, “Sleep on the floor at someone’s house!” Sure, that makes sense if you’re in tune with the punk-rock couch circuit and you know people in every city. Lots of bands have done this. And these bands have all learned that when you say with fans or friends in each city, the hosts always want to stay up all night partying with the band. We all know what this means. And at some point bands learn that hotels are a worthwhile expense. A good night’s sleep does wonders. People are rested, so they don&apos;t get sick. They get hot showers, so they feel human. It can be argued that four hotel rooms a night is excessive. That’s one person per bed. Every punk band has crowded six people into a room. But, again, Pomplamoose has hired six people, and since those people are not in the band, they shouldn’t be expected to put up with sleeping on a floor. Give them their own beds. Okay, hotels in big cities aren’t cheap, but decent hotels outside the major metro areas can be had for $75 a night. And being away from the big city means that it’s less likely your trailer or van will get stolen. Now, this is where I stop defending the band. Mr. Conte talks about spending money on road cases and other equipment. Bands at that level shouldn’t be buying instruments and cases for just one tour. Those costs are a necessary part of being a band. He might have well added the cost of rehearsal-space rental to his tour tab. It makes no sense. The musicians and crew hired for the tour should already have their own kit with necessary cases. Much has been made of the band&apos;s choice to rent lighting equipment. Like hiring the extra musicians and the crew, lighting kit doesn’t come for free. Plus it has to be schlepped from venue to venue. This means renting the trailer when it otherwise might not be necessary. The trailer and the added weight due to the equipment means reduced fuel mileage. It also adds two more axles, which can mean a significant increase in toll costs. It may also mean that the vehicle is not allowed on certain roadways, which increases travel time due to the need to find alternate routes. The lighting and the expanded band were meant to make for a “wild and crazy rock show,” because they “wanted to be invited back to every venue, and [they] wanted fans to bring their friends next time.” This just shows that they’re delusional. They’ll get invited back to every venue if they sell a lot of tickets. That is the only criterion. As for their fans, one would think that the fans don&apos;t care whether they see a six-piece band with a crazy lighting system, or just the two band members and their laptops. That doesn’t enter in a fan&apos;s thinking at all. The cost of extra salaries and the extra gear is just money pissed away. In fact, if the two members of Pomplamoose were smart, they wouldn’t hire the musicians, the crew, or the equipment. Instead, they’d get Volkswagen to give them (for promotional consideration, of course), a brand new Jetta Sportwagen TDI for use as the tour vehicle. The duo can stuff their kit and some merch into the car and drive to each gig. As noted, the fans won&apos;t care that they’re only a duo. The ticket and merch sales will be the same, and they’ll come home with $125,000 in cash AND a new car! Finally, there’s the whole notion of “building the brand.” We can both think of many bands which bought into that notion, that you need to spend more money, hire the extra musicians, do this, do that, all to get to the “next level,” and rarely do the bands get to that "next level." It’s all horse---. So that’s what I think. I hope it makes sense. It does indeed, my friend. It does indeed. UPDATE: A few readers already have pointed out that Conte is a founder of a crowd-funding Web site called Patreon, which he lauds in his essay, and the whole thing really was just promotion for that venture, his day job. (See these articles at Medium and AUX.tv.) I did not mention that because I did not want to give him another syllable of free promotion, and because it does not change the inherent wrongness of his whole spiel. For more on the business of being a band in the new millennia, see the five-part series “Wrangling with the Web: How one smart band does it,” which ran on this blog last year. Or come and hear Greg Kot and I discuss “Why Fans Rule the New Music Industry” at the Old Town School of Folk Music at 8 p.m. on Dec. 10.